From the father of Wallace & Gromit comes Early Man, a claymation creation that continues the style but doesn’t live up to the nostalgia. Nick Park is a legend for his work in this unique medium (or, at least, a medium that’s unique to still work in), and it’s nice to have another film to add to his list. Various Wallace & Gromit tales, Chicken Run, The Curse of the Were-Rabbit; Park takes his time, gets every detail in order, and then presents us with a movie to add to his canon. But that doesn’t mean that the resulting cinema will be spectacular, and his voice is definitely a very acquired, very British taste. Early Man was nice but not necessary, and I’m not sure it was worth the time and effort it took to make. In the period of the dinosaurs and the great upheaval that followed the massive comet strike, early men retreated to the valleys to live out the Stone Age in relative peace. Their favorite pastime was football, a game given them by the cosmos itself, a simple competition that provided endless entertainment. Fast forward a few epochs and Stone Age man is making way for Bronze Age man, but football still remains a pastime for the masses. Clinging to the old ways, Dug and his tribe must fight for their little valley, which has been claimed by evil Lord Nooth, who wants it for its bronze mines. They will face each other in a match on the pitch to decide their fates, playing their ancestors’ game as new eras emerge. 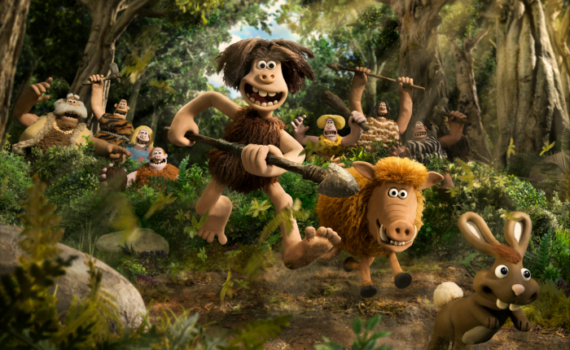 I think you’d have to have been raised on Wallace & Gromit to really dig into Early Man and enjoy it the way it was meant to be enjoyed. It’s very British, very silly, kind of dry, not very complicated, and relies heavily on the impression the animation makes, much more so than the impact of the story. The characters are dull, not super well-done (with the exception of Tom Hiddleston and Rob Brydon), and the story is oddly obsessed with football in a way that those who call it soccer will never understand. Still, watching it with my kids, I enjoyed its simplicity of content and complication of physical work; the hours they put into making these little clay figures, weaving in CGI for a bit of help, making it all come together over many years and with the help of many people. It’s impressive and mostly fun, but nothing great, and not really important enough to warrant the build-up.